Standing over 500 Feet Tall and more than a Mile Long, Steam Boat Rock has been used as a Reference Point by travelers through the Grand Coulee for centuries. 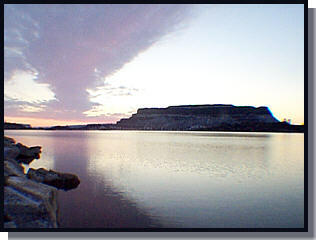 The Creation of Banks Lake as a reservoir for delivering irrigation water to the Columbia Basin Area Now Surrounds Steamboat Rock from all Sides. A Hiking Trail at the South East End of Steam Boat allows access to the top of the Rock. Steamboat Rock State Park at the base of the Rock, provides Camping facilities, Summer Concessions, a Boat Launch and a Sandy Swim Beach. Turn Right and follow road to the Entrance of the Park. Overnight Camping Fees Do Apply. See Lodging page for more information.